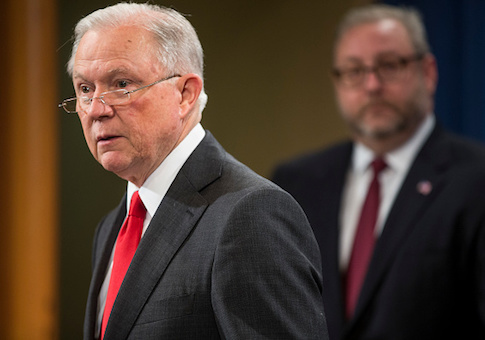 "Chinese economic espionage against the United States has been increasing—and it has been increasing rapidly," Sessions said. "We are here today to say: enough is enough. We’re not going to take it anymore. It is unacceptable." Sessions noted that in 2015, China stated publicly it would not target American companies for economic gain. "Obviously, that commitment has not been kept. Just ask GE Aviation, or Trimble, of Sunnyvale, California," he noted. As part of the crackdown, the Justice Department announced the indictment for the first time of a state-run Chinese company involved in a plot to steal advanced U.S. semiconductor technology. A federal grand jury in San Francisco indicted Chinese and Taiwanese company and three people for targeting the Idaho-based Micron Technologies, which is leading in development of an advanced semiconductor technology called DRAM–dynamic random-access memory. The semiconductor technology is a major component of advanced computing that will be central to developing artificial intelligence products for both commercial and military applications. The Justice program is part of a multi-pronged Trump administration policy of taking action against China for unfair trade practices and technology theft. The administration has imposed $200 billion in tariffs on Chinese products and is holding out an additional $250 billion in tariffs. Trump said on Twitter Thursday that he spoke by phone with Chinese President Xi Jinping and discussed many topics "with a heavy emphasis on trade." "Those discussions are moving along nicely with meetings being scheduled at the G-20 in Argentina," Trump said referring to a likely meeting with Xi Jinping later this month. Sessions, referring to "the communist regime in China which is notorious around the world for intellectual property theft," said Beijing's technology acquisition efforts against American firms too often have been successful and are the main targets of the counter-espionage program. On Tuesday, the Justice Department announced the indictment of two Chinese intelligence officers and five hackers for conducting cyber attacks on American aerospace companies. That indictment followed the unprecedented arrest earlier this year of a Chinese Ministry of State Security officer for economic cyber spying. "We will not allow our sovereignty to be disrespected, our intellectual property to be stolen, or our people to be robbed of their hard-earned prosperity," he said. "Discoveries that took years of work and millions of dollars in investment here in the United States can be stolen by computer hackers or carried out the door by an employee in a matter of minutes," he said. "This theft is not just wrong; it poses a grave threat to our national security. And it is unlawful." Sessions noted that the China threat has been overshadowed in the press by threats from Russia and terrorism but has grown "more dangerous." He noted that from 2013 to 2016 the Justice Department did not charge a single person with spying for China. But since 2017, three people have been charged with spying for China or attempting to spy for China. Five other cases are currently being prosecuted for theft or attempted technology theft by China's government. On the Micron case, Sessions said the company is worth an estimated $100 billion and controls up to 25 percent of the DRAM industry and noted China did not have DRAM technology until very recently. A former Micron executive went to work for the Taiwan company charged in the indictment and orchestrated the theft of Micron trade secrets valued at $8.75 billion. The Taiwan company then formed a partnership with the Chinese state-owned company "so that ultimately China could steal this technology from the United States and then use it to compete against us in the market," Sessions said. The indictment identified the Chinese company as the Taiwan semiconductor manufacturer United Microelectronics Corporation, and the Fujian Jinhua Integrated Circuit, Co., Ltd, the state-owned company. Three Taiwanese nationals also were indicted: Chen Zhengkun, He Jianting, and Wang Yungming. Jinhua is funded by the Chinese government and was created in February 2016 for the purpose of designing, developing, and manufacturing DRAM, the Justice Department said. The indictment charged that the Chinese operation involved the downloading of over 900 Micron confidential and proprietary files that were stolen. The Justice China Initiative is headed by the department's national security chief, Assistant Attorney General John Demers and will be made up of a senior FBI official and five U.S. attorneys and other senior officials. The program will identify priority Chinese trade theft cases and see that they have enough people and funds and that they get high-level support. Additionally, the initiative will expand national security reviews of Chinese investments and purchases in the United States and foreign agents' registration. The foreign agents' effort will be to "counter covert efforts to influence our leaders and the general public," Sessions said. "Today, we see Chinese espionage not just taking place against traditional targets like our defense and intelligence agencies, but against targets like research labs and universities, and we see Chinese propaganda disseminated on our campuses, he said. The attorney general said the problems posed by the Chinese government must be solved. "These threats must be ended," he said. FBI Director Christopher Wray said China poses the most significant threat to the United States. "No country presents a broader, more severe threat to our ideas, our innovation, and our economic security than China," said Wray. "The Chinese government is determined to acquire American technology, and they’re willing use a variety of means to do that–from foreign investments, corporate acquisitions, and cyber intrusions to obtaining the services of current or former company employees to get inside information," Wray added. "We are committed to continuing to work closely with our federal, state, local, and private sector partners to counter this threat from China." The Justice Department also filed a civil lawsuit that seeks to enjoin the transfer of stolen trade secrets in the case and to prevent the defendants from transferring information stolen in the case. The indictment was filed Sept. 27 and unsealed Thursday, when the civil case was filed. This entry was posted in National Security and tagged China, Jeff Sessions. Bookmark the permalink.